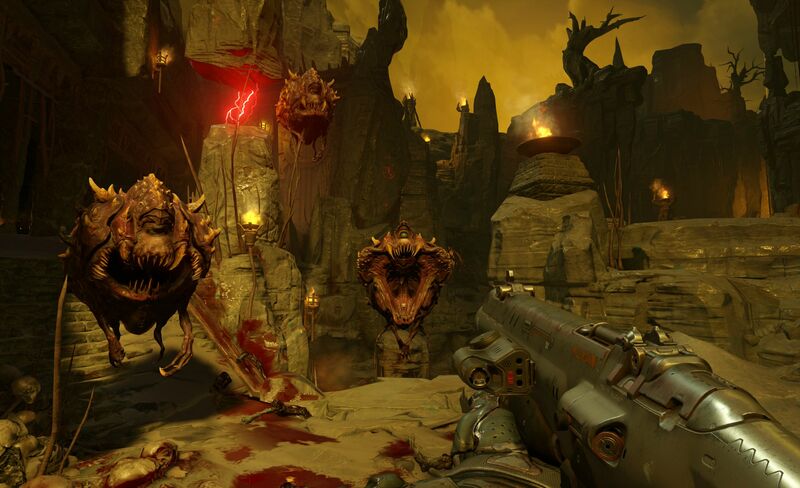 I was able to get into the DOOM closed multiplayer beta over the weekend because I owned Wolfenstein: The New Order before a certain date – what a pleasant surprise! There were two modes available: the classic team deathmatch and warpath, where you had to keep control of moving zones by staying within their boundaries for a set amount of time. It seemed to me that a lot more people were playing warpath, but I found it annoying – the announcer is always telling you about the state of the zones, and the scoring is a little ambiguous compared to how straightforward team deathmatch is. The game keeps track of your stats: you level up, earn 34 different commendations and 65 different medals, and your K/D ratio from the last ten matches is also tracked. There are also challenges, which I think might be achievements, but it’s not made clear. You get to customize your space marine, but you can’t choose your gender (I don’t know if this might be coming later or if it’s unlockable – at any rate, you can’t see the marine’s face, so you can really imagine what you want under the mask). What is customizable then? The color, pattern, and style of your armor and weapons, complete with how dirty and scratched you want them to be. There are three different default weapon loadouts to choose from – assault, sniper, and ambusher – and you unlock custom layouts at levels two and twelve. There are also hack modules that give you various advantages, like starting out with armor. You unlock more of all the customizable items when you play matches and level up. The weapons are pretty standard – rocket launcher, vortex rifle (railgun), super shotgun, plasma rifle, heavy assault rifle, lightning gun (unlocked at level 2) and static rifle (unlocked at level nine). You’re able to mute everyone before you go into a match, which was welcome. The games I played were fluid and fast-paced – ten minutes seemed to go by in a flash. There are a lot of cool small details in the maps – dripping blood (and water) gets on your visor, the floor is sometimes gooey, and when you jump up onto a ledge, your hands come out in front of you to pull yourself up. The coolest thing in the game, however, is the demonic possession mechanic. Every so often, a demon powerup will spawn on the map. Whoever picks that up is possessed by a demon, and gets to run around and basically stomp everyone to death, I guess? It’s not clear why they die when you barrel into them. Anyway, it’s AWESOME. I can definitely see a mode being created where everyone is a demon all the time. If you happen to kill someone with the demon powerup, you can pick it up and become possessed yourself. I experienced some crashing to the desktop, including when I tried to skip over the opening logo cinematics and when a new team deathmatch was about to begin after the previous one had finished. The full game comes out on May 13, 2016. Follow the game on the official site, Facebook, and Twitter. Let me know if you have any questions about the beta either in the comments or by talking to me on Twitter. Thanks for the sneak peek! I preordered this but likely won’t touch multiplayer.